Ding. You throw a coin in. Crrrrr. Ding. Three different symbols. Nothing. Ding again. Crrrrr. Ding.. You simply do not believe, that such bad luck could ever happen to you. 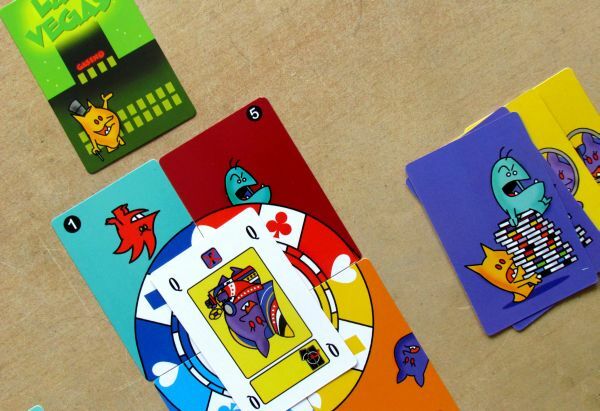 You throw coin after coin inside colorful machine slot, eventually leaving the casino with empty pockets.. You caught gambling disease again..
Luckily for you, there is a cure in form of a simple card game. This will allow you to experience thrill of casino visit at home on the living room table. You can take your luck with yourself home and it will be also accompanied by merriment of Odynauts and on top of all that – it will not cost you anything (besides the buying price). But to win the main jackpot, you must have in your team at least one so-called chip leader. After him the whole game of Odynauts is named – Chipleader. 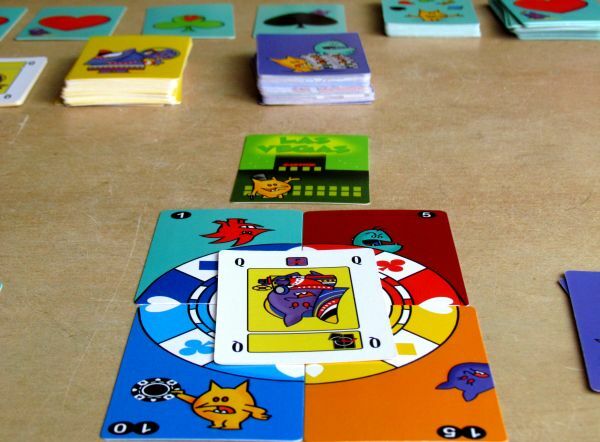 This is the second game in funny card games by Steffan Ros, where cheerful and colorful creatures are starring. Their entire family is called Odynauts and according to their name, also publishing company is Odynaut Games. Inside lanky red box with portrait of one real chipleader, a most talented odynaut gambler, there is trio of decks hidden. The package is big only enough, that three classic card decks are next to each other with a booklet of English rules on top. 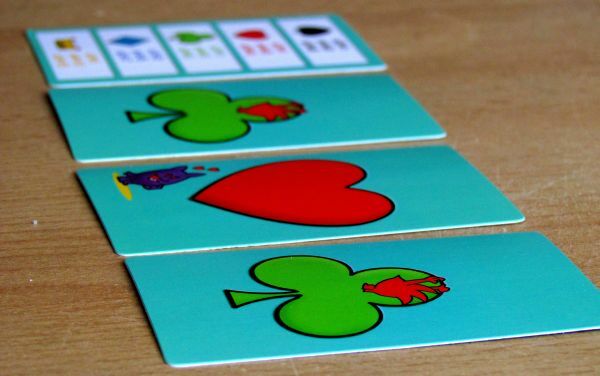 First is light green deck of cards, which has a juggler drawn on the back. On the other, more important hand, you will always find one of the five symbols – spades, hearts, diamonds, clubs and special crowns. They will be called color cards from now on. You will also need a purple card of chip quarters and point value. 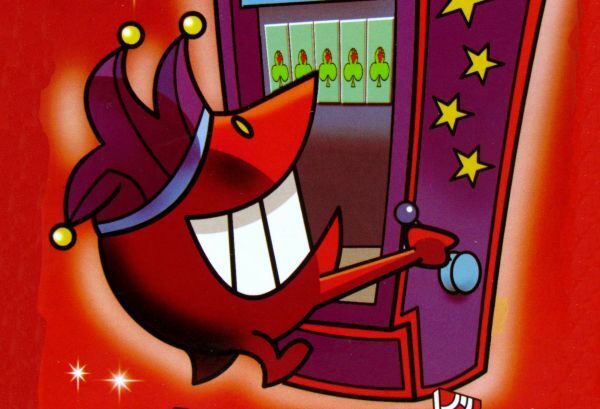 Without them, no one is allowed to even enter the casino, so you will be collecting those. They are also your reward in real life for danger you put yourself into, when you are making hazard decisions in the casino. 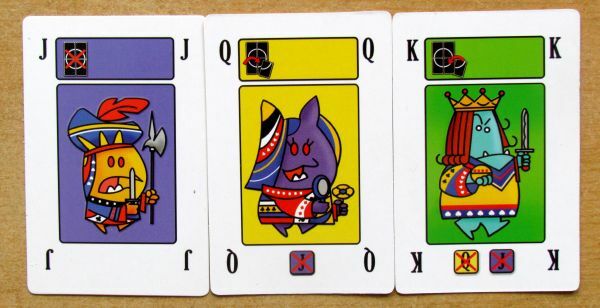 And then there are yellow action cards, that also have several values: J, Q, K, A and joker. 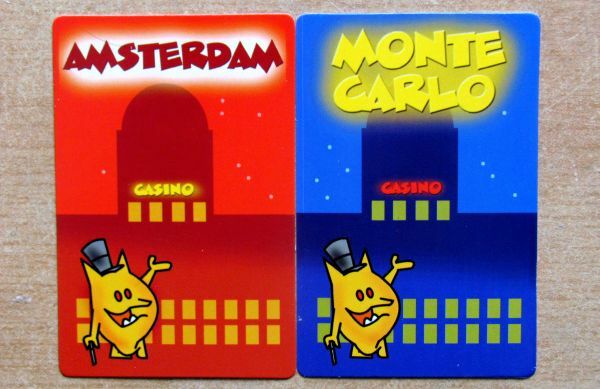 Among both yellow and purple cards, you can also come across images of five world famous casinos. Completely on the bottom, there are still buried help card, that suggest, which combinations should you create. The game of Chipleader begins by mixing all three piles. 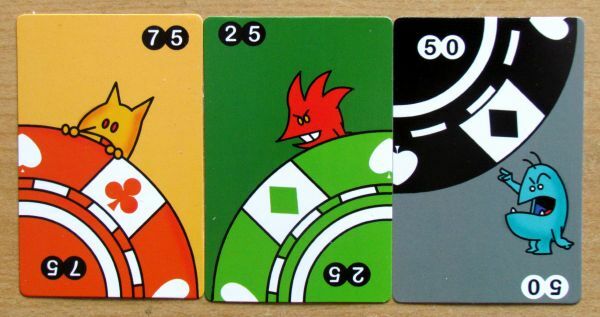 Then you create a hazardous line of five random color cards. Each player also receives three of them in his hand, where he will be using them to play. 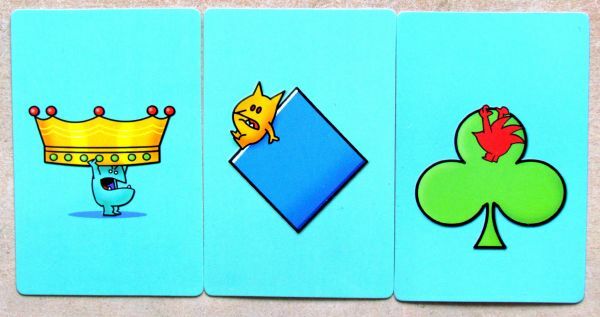 These cards, however, are layed ahead at the beginning of the game and everyone will know exactly, what colors are you holding. This finishes preparation and we can start to take risks and playin all in.. I mean with cards and victory points. No money this time..
Each turn, a player can succumb to gambling, which uses common line of color cards in middle of the table. His job is playing correct colors from his hand, so a combination of three, four or even five adjacent cards of the same suit is made. Or you can take a real risk and exchange one card from your hand for a chance to cover any number of cards with new ones from the deck. You choose place first and then draw a card, so you are really taking a blind shot. Both ways can be first step to success and it’s basically a slot machine with characters such as on title picture. 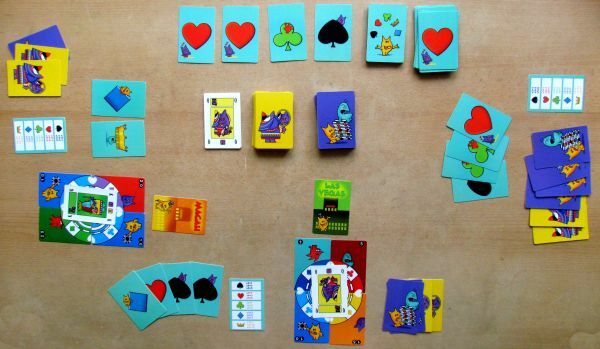 Once this is accomplished, according to the successful combination, you can get a reward in the form of lame one to enormous fifteen cards. 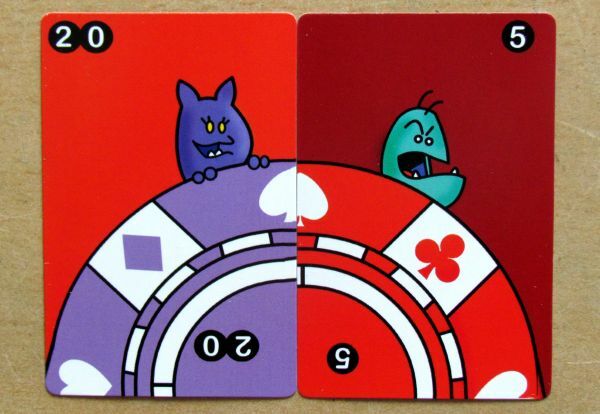 Moreover, with a successful gambling, player receives one new color card (the other ones acquired as reward are not colors!) and puts it on the table in front of him. Income of action and chip cards varies according to the size of the combo, but also by color used for it. 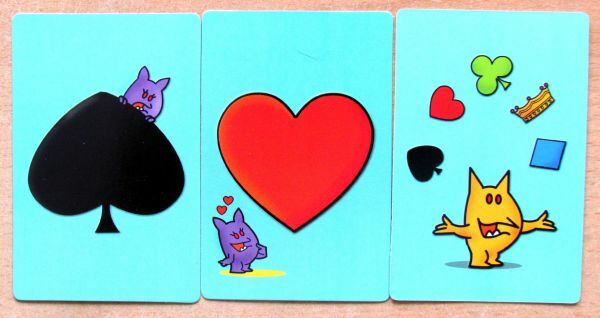 Basic spades, hearts and clubs are only for one, three and five cards (combination of 3, 4 and 5 of same symbol). However, diamonds and crowns are worth more. Obviously, they are also harder to collect. With these rewards, players finally delve into other two decks – chips and action cards – and add them this time really into their hand and not for everybody else to see, like color cards. Gain can be divided in any way you like between those two stacks. 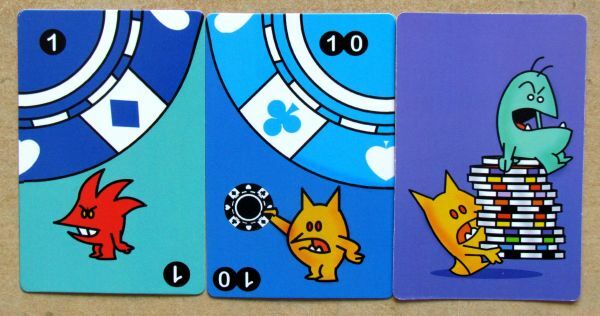 But in the course of a turn, you have to play most of them immediately, because at the end of your turn, you can hold only five cards in your hand. However, the same limit applies to the color card, you have on the table. Altogether, you can control up to ten cards. Cards of casino chips are wearing always one quarter of the entire token, which is worth something. One quarter is just valueless. 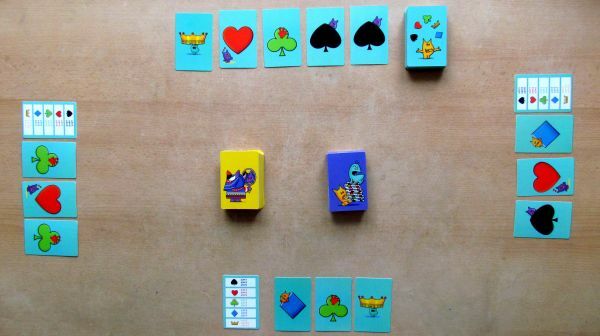 You need a total of four suitable cards, to compile one whole chip. But they do not always fit. They may not have all the same color, but its value is determined as the sum of its parts. The moment you assemble chip, you still need a casino card to play them. It shows, where you actually won your token and it is a proof, that your friends Odynauts believe you, when you bring it with yourself. Only together – four token parts and a casino card, can player put on the table in front of him and here starts main fun, game offers. 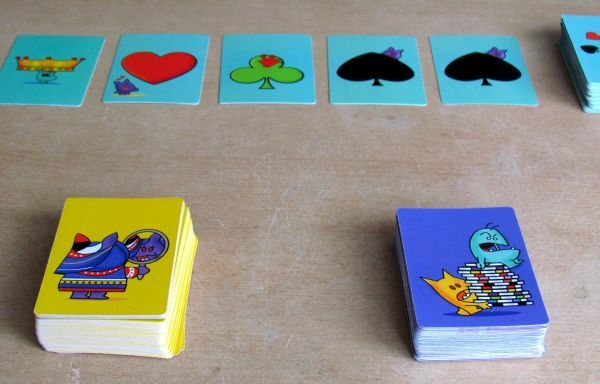 You get to play action cards, which can also increase or decrease value of played chip cards. These allow players to interact and fight for final victory. These cards are crazy, because you can put them also on your opponent’s chips, in case there is no other action card there. But even if there was any, you can attack it. Of course, you need a higher value, than the defending card. 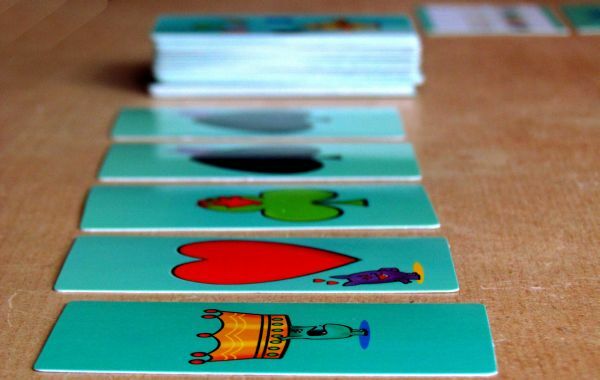 Ace beats King, King beats Queen and so on, as we know it.. 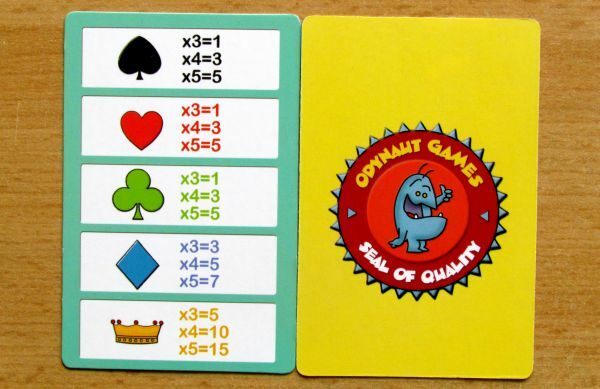 Thanks to action cards capabilities, you can replace some chip quarters (K), change order of chip quarters, in case there are lying more of them (thanks to other action of Queen) or even nullify the entire chip by placing J cards. This is also lowest card, which could easily be attacked. But opponent must sacrifice some action card, he would otherwise use to attack you. You can also give up your whole turn and draw one color card instead. This will improve your situation for the next round, but you lose the chance to play in that given moment. It is important to estimate time, when is profitable to skip a turn. 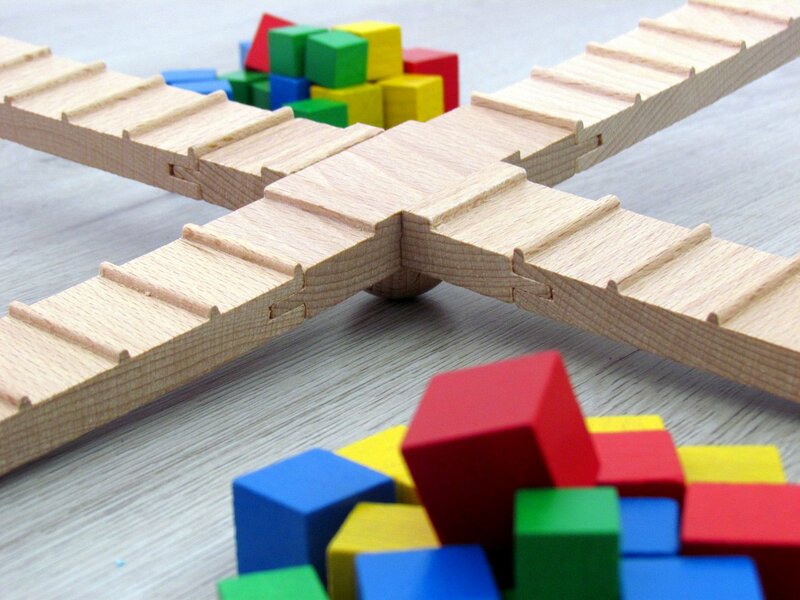 But if you are successful in creating combinations, it is possible, that you will not even need it. 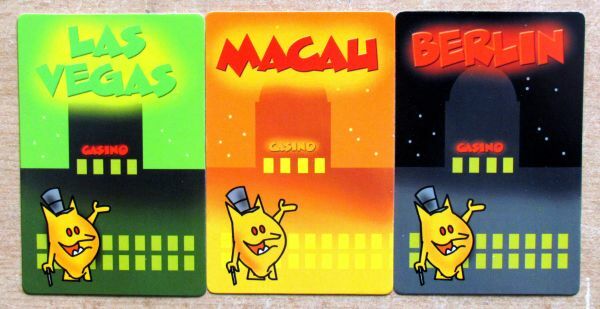 Once players visited together all five cities, which are available in the game, game ends immediately. That is a moment, when five different casino cards are lying on the table, but in fact there may be more, because each city is present twice in the game. One action card in the deck and one in the pile of chips. Winner will be determined by sum of all points on its completed chips. Of course, only visible and not nullified cards are counted. 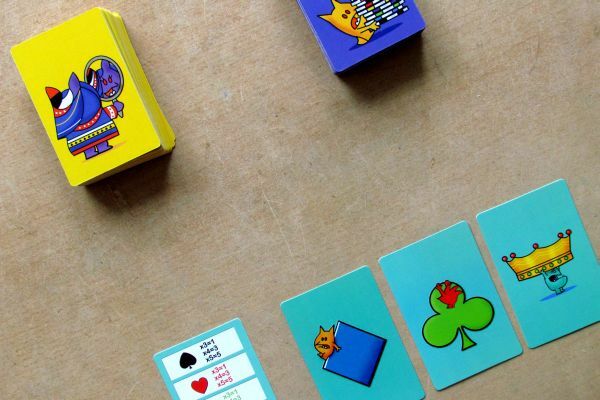 Card game Chipleader is in reality merger of two specific mechanics. With the help of good luck, you create combinations of the five available colors. Just so you can get your hands on valuable tokens, that will pave your way to victory. This success in gambling gives you opportunity to draw a certain number of cards. It’s up to you, how this chance will be divided among these two piles. 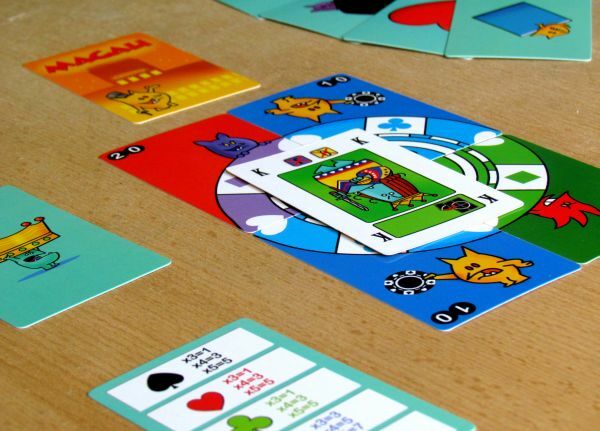 While the chips can be played to get points, action cards can help you to defend them against opponents attacks and even allow you to annoy your opponents with them, block and meddle with their chips. The sheer entertainment value basis of Chipleader lies in these action cards. All five available values allows some tricky things to harm opponents, like resetting values. But you can also improve your situation and squish lower one you have in your hand. These options of switching points result, that even before the end of the game, there is no sure winner. 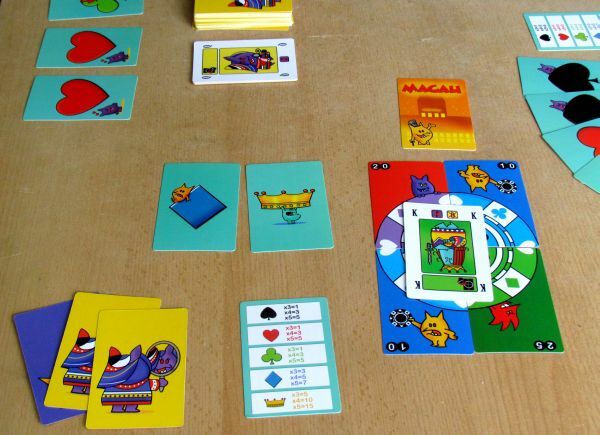 Moreover, action cards can also be used to defend and fight for chips. So war is actually divided into two phases. First you have to break the defense and then you can start to break out of the opponent’s pieces chip stocks. This way, the tug for points moves from a random draw somewhere entirely else. 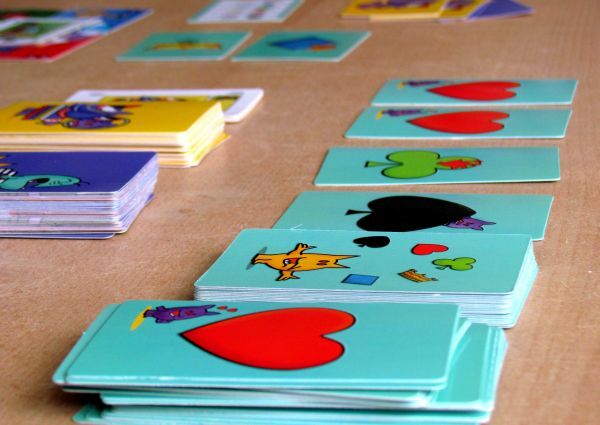 Although one of the players may get lucky and draw a lot of chips and casinos, is not really usable as such, because another has for example a large number of action cards. And this will make their playing very unpleasant. 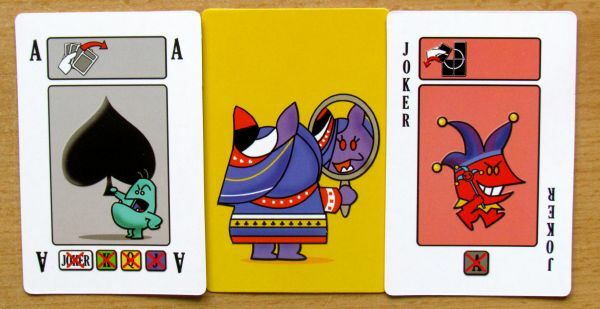 With the help of aces, you can even take a card from hand and a joker, although he is already the only one, who defeats the ace, can also completely remove one part of finished chip. Unfortunately, path to a fun game, will be really unpleasant due to clutterly written rules. It is chaotic as it first inform you about entire course of the game, but later in the detailed description of individual phases, some basic informations are not mentioned again. 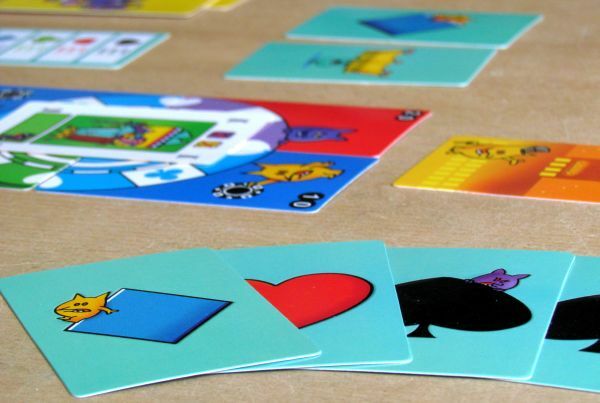 In the first game, you will be puzzled and look through pages back and forth to make sure about some principles. 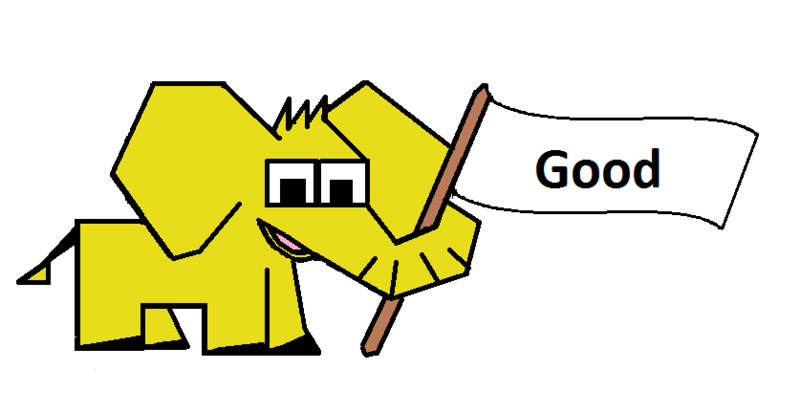 Graphics are cute again, for which we can clearly blame Odynauts themselves. These are the same characters with whom we have already met in the Playing with Fire game (review). This time, they went to the casino and they are funny again. 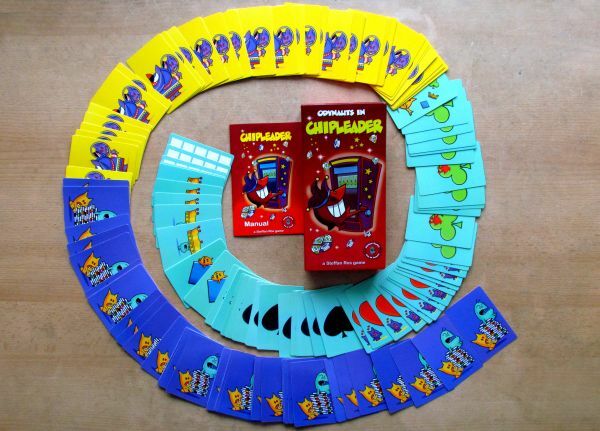 Chipleader is a fun card game, that seems to be largely influenced by chance at first sight. But then come action cards and completely change your perception of the game. It quickly becomes a hostile battle for life and death to secure safety of your casino token. You must carefully follow the opponent and react to the cards, which lie before them. Yet you do not know, what hides in his hands as secret weapon. Just a pity, that there are unnecessary obstacles between you and the fun – we mean rules. Before you really learn how to play Chipleader (although its really easy game), you could already lose interest. And that would be a shame..
Chipleader is a card game, which invites you into a casino. You can spend all your virtual and never existing money there. 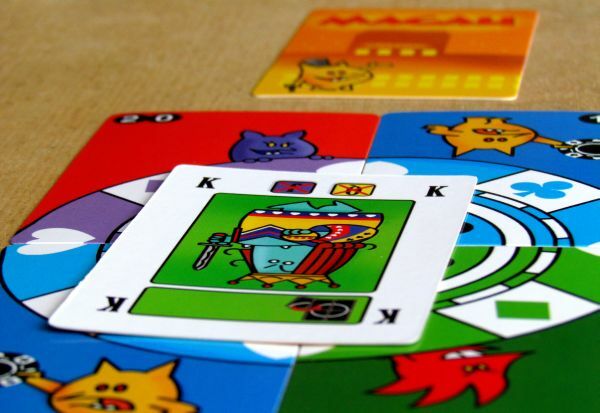 You must take risks and by clever playing make combinations of three or more same cards. For this gambling, you get chips and also another actions to support your play. You ten try to complete chip quarters into whole one and put it in front of you. But with it, the fight only begins! 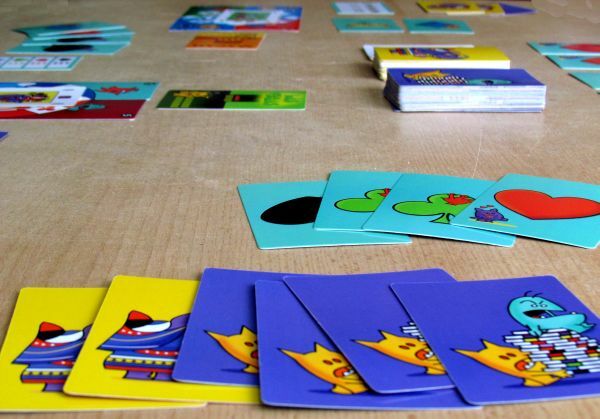 Chipleader offers tense and original fun, which looks more random, than it really is. Luck can influence the outcome, but you have much more control, than you would think. Unfortunately, its not easy to learn this game, due to fuzzy and crowded rules with incomplete descriptions. Its all there, but not in one place. But once all gears fit in, you could enjoy interesting game with many direct conflicts. So pull the lever and let yourself be carried away on glittering of money!